Great Price. After I got it I saw all the reviews. I may have to upgrade. So far so good. I bought this due to price. So far it doesn't have much to do since the only stressful component i have is the single 390. This is a tier 3 PSU which works since I'm not going to crossfire and i cannot Overclock. It did come with more cables than i will ever use. Edit: I did end up getting a seonc 390 and going into crossfire, This PSU held its own with a xeon and 2 390's crossfired and overclocked. I pushed this thing to the max and it kept on ticking. Honestly, thats great. Its a no frills budget PSU that isnt afraid to get down and dirty. Only knocking a star off because the cables are ugly, and i might need to buy some extensions down the road, only worried about the lack of cable room i have left so I'll have to see if it would even fit, otherwise it does exactly as it should. For a first time build, the fully modular aspect was slightly bewildering. But the end result was so much nicer than a semi or non-modular build. I read reviews, and made a decision. Many people don't like Rosewill, but the PSU worked for me. Maybe I won the PSU lottery getting a Rosewill without defects or shipping damage. But the point is it works. yes it's rated much higher than the parts, but that's one of the things I stand by when building. If the PSU is too close to the parts, a slight dip in it's effectiveness could brown out the whole PC. 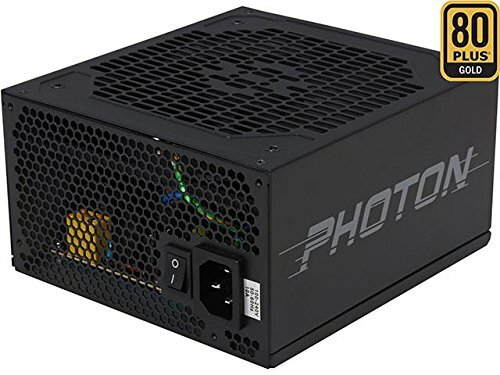 If the wattage is much higher, a worse PSU that doesn't meet it's potential due to being ****** has a slightly less chance of frying everything. Why not just get a good PSU? No good reason, it's always a better idea to just get a good PSU. This one turned out great for me, but I usually order EVGA Supernova PSUs these days. If you don't mind some Ketchup and Mustard in your setup then this is a good Powersupply. EDIT: Don't bump the power cord socket. The cord included does not sit flush with the PSU and you will power down your system if you bump it. For the price, this power supply is probably one of the best. 750 watts of 80+ gold certified power delivery with a price of under $80? I'm sold. Although the stock cables are admittedly terrible, who actually uses stock cables when buying modular power supplies? Usually the point of modular power supplies are to get your own custom cables. No star reduction. 5/5 recommend this to any builders out there that need this much power. from completed build Anidees Crystal Cube Lite "White"
Nice, cheap underrated power supply. Comes with Warranty and does its job really well. Stock cables are not that good but cant complain for the price as the supply is fuly modular, just geed better looking aftermarket cables.